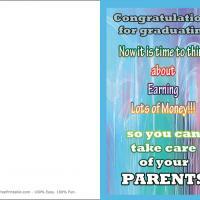 These printable Graduation cards feature a simple funny message against a colorful blue and purple background. Print these free printable cards and fold in half. Then you can write a personal message inside. Don't forget to encourage the new graduate as they embark on a new path of life. Maybe some of that money making and caring will happen! This is a great card for parents to give to their high school or college graduates.